Regardless of the anchor type, it is critical that contact between the minerals in the stone and the metal be controlled to prevent corrosion of the metal, which would compromise its strength. As noted in the descriptions of the various anchor types, these systems may be both ferrous and nonferrous, and components most often involve stainless steel or aluminum. The issue of corrosion is directly linked to the application and material influence on the anchorage system, mainly in that different stone types are more prone to moisture penetration or have mineralogy that affects the metal of the anchor more than other stone types. 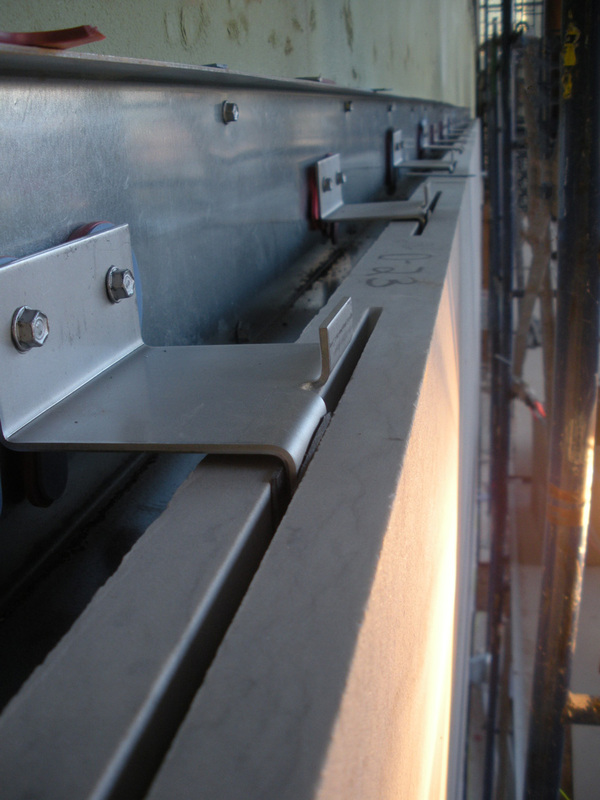 Consequently, installers need to consider the combination of anchorage systems and stone types in the context of specific climates and environments. For example, limestone in an arid climate will be less susceptible to corrosion than in a more humid or wet climate. Architects should be aware of possible corrosion issues and discuss the possibility with the project’s structural engineer and the stone installer before finalizing any decisions. Some examples of problems that can happen when metal comes in contact with different types of stone are listed below. 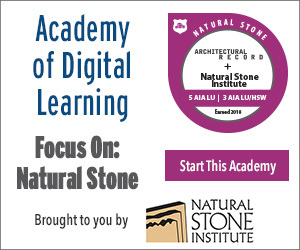 These examples can be used as a starting point for considering anchorage options for natural stone. Calcareous stone types such as limestone and marble are prone to corrosion when in contact with certain untreated metal components. Any metal used must be coated or sheathed with a compound that does not react with the stone (or other cladding materials). Moreover, the coating must be compatible with the joint sealant. However, not all metal components are vulnerable to corrosion; for example, stainless steel types 302 and 304 can be used without any protection. Aluminum alloys can be problematic if they come into contact with both moisture and certain stone minerals. For example, when used with calcareous or calcitic stone, aluminum can potentially corrode, even if it has first been anodized. Corrosion can also happen if inappropriate components come in contact with siliceous stone, such as granite, and if moisture is present. As such, noncorroding materials must be used. As the saying goes, a chain is only as strong as its weakest link, and the same holds true for anchorage systems. Anchorages for natural stone cladding typically require that the joints and surrounding spaces be allowed to accommodate movement. 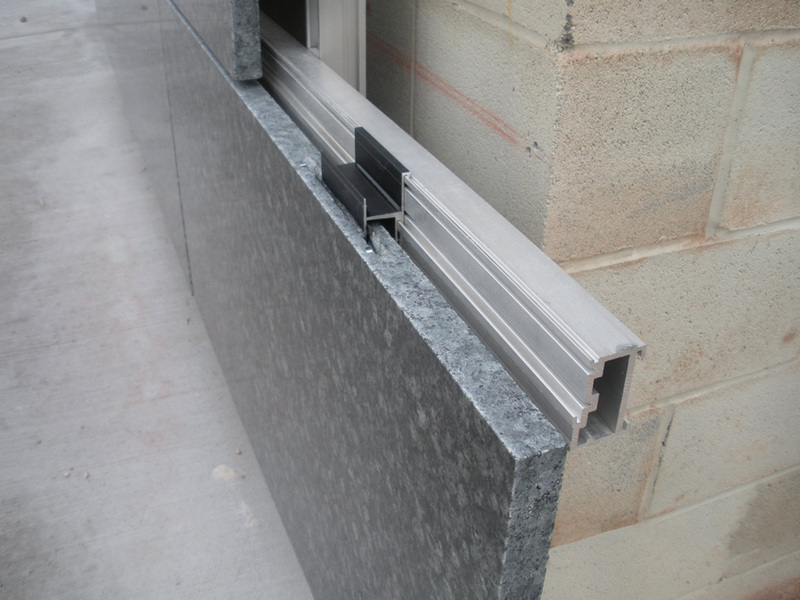 Sealants can be used to weatherproof joints between the stone panels and any adjacent components. This sealant will be wet when applied, but will cure “soft,” functioning as a gasket to insulate movement and serving as a buffer between cladding elements so that forces are not transferred between the parts. The filler material resides in the anchor prep and displaces the void between the penetrating anchor and the interior walls of the anchor prep. Gypsum-based fillers were popular several decades ago but are no longer considered appropriate for natural stone cladding. Exterior cladding that was installed during the era of gypsum-based fillers reveals that the material has a low strength and is vulnerable to swelling or erosion if exposed to even a small bit of moisture. The combination of gypsum-based materials with portland-based products should be avoided. The combination of the two materials will create a hybrid known as “ettringite.” Ettringite has the unusual property of having a greater volume than the sum of the two parent components, and thus expands. Cementitious fillers, such as portland cement-based setting grouts, are common and easily available. These fillers tend to cure rapidly (often within 30 minutes) and are appropriate for many projects. That said, they may be vulnerable to swelling or erosion when exposed to moisture, and thus may be inappropriate in certain environments or for certain projects. Resinous fillers, or adhesives, usually refer to epoxy. These fillers are more expensive than other options and typically have slow cure times. There are known problems with the high level of rigidity of epoxies in their cured state, which has been associated with increased stresses near the anchor prep as a result of limited flexibility. These factors make epoxy appropriate for certain anchorage systems, but not others. For example, they are safe for securing dowels in cubic stone sections, such as stairs pieces, which are supported by the structure below, but they are not appropriate for thin stone cladding, where the requirements for a flexible connection come into play. Elastomeric fillers, such as silicone and polyurethane sealants, are popular choices for filling anchor preps in part because they are flexible in their cured state and allow for dynamic movement within the anchorage system. This characteristic is beneficial for projects where the stone cladding may require very flexible connections. Pictured is an example of bent stainless steel shapes installed in stone cladding. Shims work as physical spacers. They are typically made of either stainless steel or the more popular high-density, high-impact plastic. Regardless of whether the shim is made of stainless steel or plastic, it must be able to bear the load without deforming. In some cases, shims are used to provide additional support, while other types of fillers cure, after which the shims are removed. As the building industry continues to “go green,” anchorage systems will follow the trend, especially as new materials are put into use. One change on the horizon is low- or zero-VOC chemical anchors as an alternative to traditional adhesives. Eliminating volatile organic compounds in chemical-based anchors and adhesives is particularly important for interior installations, and the change can positively affect awarded LEED credits. Another modification to chemical adhesives is an “improved UV stability” designation. Any adhesive material that is exposed to sunlight is also exposed to UV radiation, and over time the adhesive will change color. Newer products will minimize or eliminate this problem. Two other areas of innovation are in the cure rates of adhesives and improved delivery systems. Many new adhesives now cure much more quickly than traditional options. The trend is toward strong adhesives that cure quickly and safely. Meanwhile, other companies are exploring ways to improve how the adhesive is mixed and dispensed, with the aim of reducing waste. For example, an improved trigger mechanism on the adhesive gun makes it easier to squeeze, which results in less wasted material.